Once again a player I identified in my pre-combine makes an appearance. Like Richardson, Williams didn’t stand out at the combine but again that isn’t necessarily a bad thing for the Titans who may not be picking a DT until rounds 3 or later. 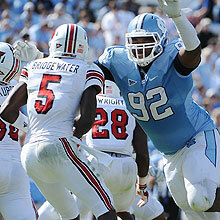 Williams may be the best 3 tech DT in the draft and is very versatile. Many project him to the 34 but he is a perfect fit for the Titans DT position. He also plays the 4-2-5 scheme I referenced in my Jamie Collins blog.